iMovie is the pre-installed program coming with every new Mac. 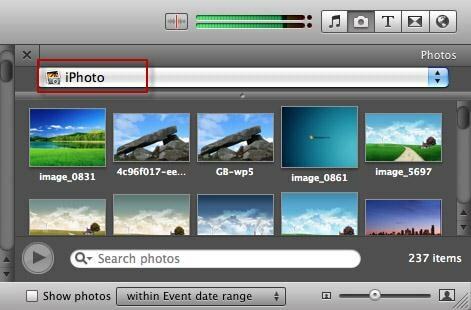 It provides a simple yet professional way to make slideshow movies from your photos, videos and music. 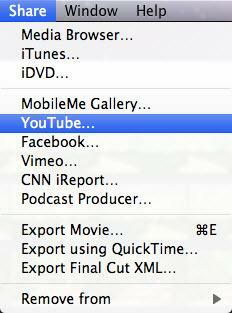 Now make your own iMovie slidleshows by following the steps below. iMovie works seamlessly with iPhoto. You are suggested to drag and drop photos from iPhoto to iMovie project. If no any library exists in iPhoto, create one and import photos to iPhoto first. To add videos, you could go to either "File/Import" or Event Library, and then drag and drop selected videos to the timeline. After photos and videos are imported to iMovie slideshow project, you can preview the raw slideshow simply by pressing Space bar on your keyboard. And then make adjustments to clips and transitions. For example, mouse over one clip or "double arrow" button and click on the settings icon, then you could access clip adjustment, video adjustment, transition adjustment, etc. Music set the tone of your slideshow. Adding musing to iMovie slideshow is just as simple as adding photos and videos. So click the audio icon in the bottom right corder, and drag and drop desired audio file to the timeline. 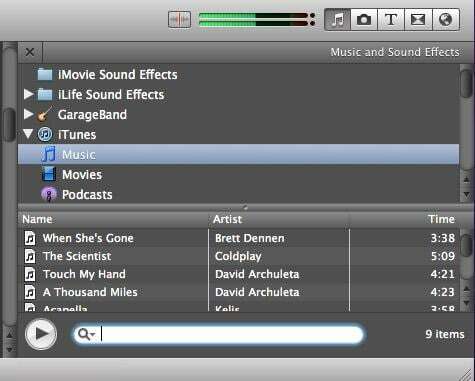 Multiple songs could be added into iMovie. However, iMovie doesn't support multiple soundtracks. If necessary, you need to combine multiple song tracks with external audio editor before importing to iMovie slideshow. You can also apply audio effects and filter sound using an equalizer. Movie makes sharing possibility endless. For those who upload their videos online, iMovie allows users directly upload to MobileMe Gallery, YouTube, Facebook, Vimeo, CNN iReport, etc. If you select to share iMovie slideshow using Media Browser, you will get slideshow appeared in other Mac applications like iWeb. It's a good idea to export iMovie slideshow to iTunes so that you can playback slideshow quickly and easily sync with your mobile devices like iPhone, iPod and iPad. If you are going to make slideshow with the Music on Windows, you may need a slideshow making tool to so it by yourself. DVD Slideshow Builder Deluxe will be a good choice. It helps you instantly make such an impressive slideshow from photos and videos for sharing virtually anywhere.